Tianjin explosion: At least 50 killed, more than 70 in critical condition. 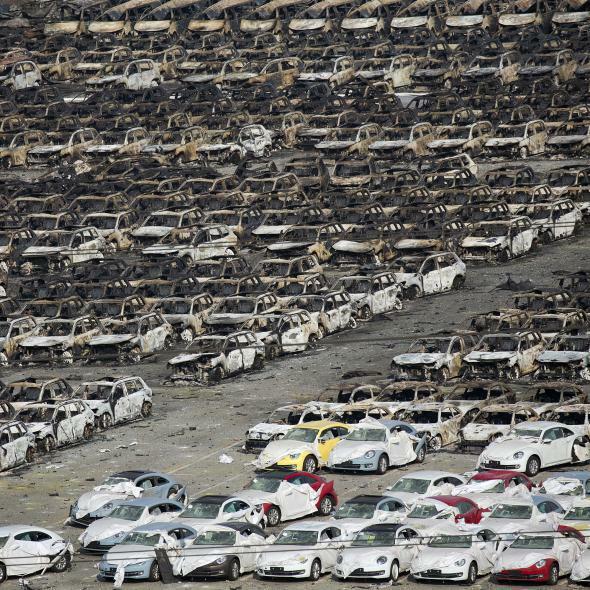 New cars damaged in the Tianjin explosion. The explosions originated at a warehouse site owned by Tianjin Dongjiang Port Rui Hai International Logistics Co. Ltd., a company that stores and transports dangerous chemicals. Company executives have been taken into custody, state media said. Tianjin is roughly 80 miles southeast of Beijing and has a population of 13 million. A resident who lives more than a kilometer from the explosion site told CNN his apartment was hit hard by the shock wave from the blast: “It blew out the glass, it blew out the doors, it knocked out the power,” he said. More than 700 people in the city have been reported injured in total.